Audible is still BAE and I am still listening to any book I can get my hands on. Confession: I love Bravo. I love the Real Housewives series, and I love Andy Cohen. He is such a larger than life character and he just always looks like he's having fun. When I heard back in October that he was coming out with a book (I didn't realize he had already written a book called Most Talkative), I knew I wanted to read it. Then I read reviews and heard it wasn't that great. Fast forward to two months ago after I finished Bethenny Frankel's relationship book. I had so enjoyed listening to the author read their own book that I knew I wanted to continue that streak. 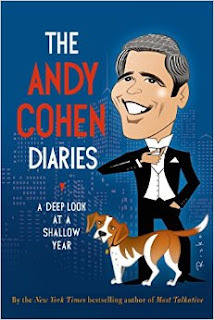 I wasn't ready for a fiction book so I figured since Andy Cohen narrated his book "The Andy Cohen Diaries" it would be a good choice. I will preface by saying I wouldn't have liked it if I wasn't listening to it. Hearing him explain the stories in the book, exaggerating certain parts, and hearing him name drop was just too good. You need to listen to this book to really enjoy it, in my opinion. Basically, the entire book is one big diary. He starts off with the date, and takes you through a year of his life. From Real Housewives Drama, to him getting his famous dog Waca, to participating in a softball tournament, to Joan Rivers death, it was all highly entertaining. Listening to him speak the words he had written was hilarious. I had to choke back laughs on the train on a daily basis. It was so outrageous, and if you've ever watched 'Watch What Happens Live" you know how insane Andy Cohen can be. Getting a look inside his private life was so interesting, like reading a giant issue of InTouch Weekly. It was filled with behind the scenes scoop, every celebrity name you can imagine, and trips to Europe and private islands. Andy is BFF with Sarah Jessica Parker, which I didn't know and her name shows up quite a bit. So does Cher's name. Side note: Andy does impressions of a few great celebrities and they are hilarious. Not good, but funny. It was filled with laughs and love and drama and inside scoop, and created a great portrait of what it's like to be famous, work with these incredible people, in New York City. It was borderline inspiring, in a weird way, to listen to Andy's daily tasks and how much goes into his job. This is the perfect low, key summer reading (or listening). If you are much more of an actual reader, and love celebrity gossip and Bravo, pick this book up. It's an easy, quick read *or listen, and it's a great in between for when you don't know what to read but you want something not serious. I love celebrity memoirs and I think this was a perfect one to add to the list!